Not talking about this T, but suggesting that just maybe we should take a look at some other Ts. The Ts that are contained in Verse 70. Have you ever noticed them? Do they strike you as being a little unusual perhaps? Line 3. has two Ts, Then and Then, the first T is crossed and the second one is a 'floating' cross well away from the T.
Line 4. has 3 Ts, Thread 'floating' cross, Penitence, not crossed, Tore, a 'floating' and extended cross. 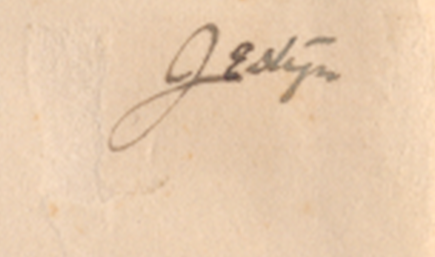 Signature, one T in JesTyn, 'floating' shortened cross. Repentence oft, but, then (and) then, thread penitence tore. Clive had a great thought that maybe the T was used as a message prompt as in the book being exchanged with no crossed Ts and then crossed to be returned and as a way of acknowledging the receipt of the book, perhaps indicating that a message was on its way? Whilst it's fair to say that people sometimes write and form their words inconsistently, it's a matter of degree. Is it common or less common to show such variations within a relatively short paragraph? Whilst of late we've published a number of images from Service records, it crossed my mind that many may not have had an opportunity to view the source materials, so, here are 3 PDF downloads which contain the information that has been used to substantiate the contents of recent posts. 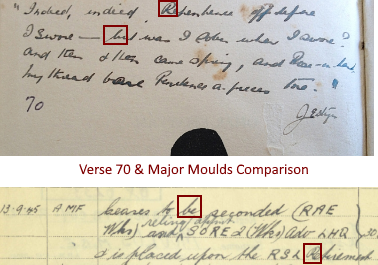 Verse 70 on the right was in my opinion signed and quite probably written in its entirety by Major William Jestyn Moulds. Every word in the verse and, indeed, the image of the Fez Lady, contains micro written letters and numbers as per previous posts and images. As an aside, I bought my copy online from a small shop in North Wales, when it arrived and to my amazement, the book had once belonged to a former teacher of mine. Small world. 3. Lieutenant Colonel Desmond Otto Muller Service record. There are 48 pages in total, they contain the usual service record information as well as examples of handwriting and signatures. This document is being shared whilst Clive and I are still working on its contents. I can tell you that there are a number of interesting aspects of this document. It is a downloadable PDF of the NAA record. Lieutenant Colonel Muller was Major Moulds Commanding Officer. for a time. You will note that at least one set of handwriting is a very close match to another written record in Major Moulds document. The story of the good Major is becoming increasingly complex. The first thoughts were and still are that this man was the same man that took part in the writing of the now famous Verse 70 supposedly written by Jessica Harkness in the Rubaiyat of Omar Khayyam that she gave to Alf Boxall, the then young Army lieutenant. Again, supposedly, she had signed off that verse with the name JESTYN. The enthusiasts amongst the audience will immediately notice, though similar, there is a variance between each signature. Nothing unusual in that, not many of us will write exactly the same style of signature each time we sign off. 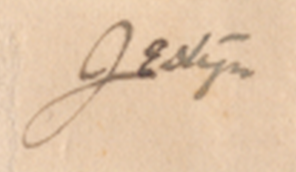 You may notice that signature 4 appears to have been overwritten, specifically the 'e', the 's' and the 't'. On close examination, you are right, it has been overwritten but for what purpose? 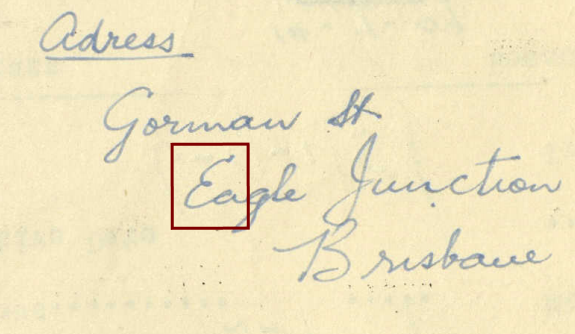 I think that all signatures were made by the same person, the letter 'E' in example 5, was done for reasons partially unknown but more on that in a later post. the last letter 'N' is almost identical in each example and the Y is not that different at all. 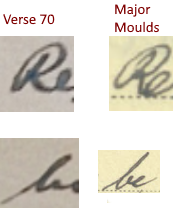 The T and the Y in the verse 70 signature is very similar to examples 2, 3 and 4 from the Major. The J is slightly different in each case, if I were to compare it then the examples 1 and 2 have similar lower portions to the verse 70 example. 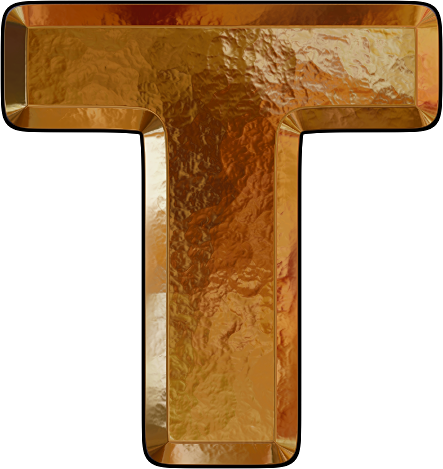 The letter T has a joined crossbar whilst in verse 70 example it 'floats', again there is a reason for that which will be addressed in a later post. This discovery is extremely important, firstly because it puts the lie to the previously held views that Jessica signed off Verse 70 herself. She did not, Major William Jestyn Moulds did that. Secondly, this now puts Major Moulds very probably in some sort of association with Alf Boxall and quite probably Jessica and the Musgraves. The coincidence began with the realisation that both Lieutenant Alf Boxall and Major William Jestyn Moulds both belonged to the same Regiment, The Royal Australian Engineers. 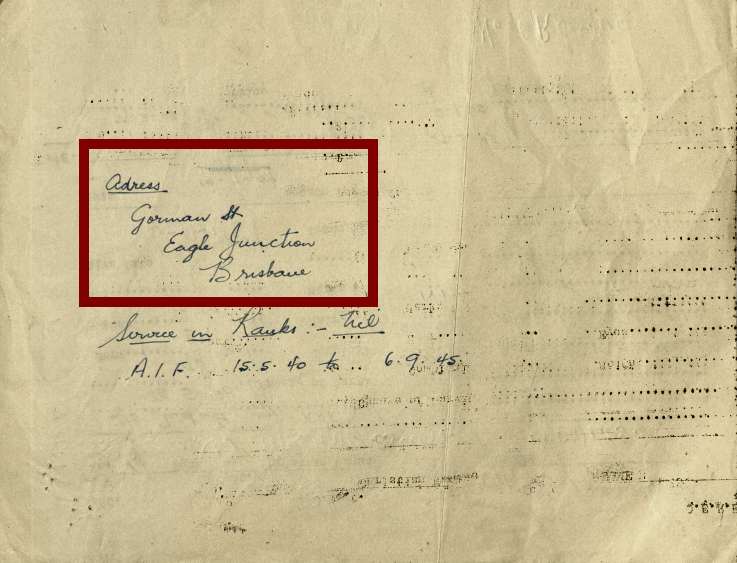 Here you can see the notation made on or about 13th September 1945 where Major Moulds is placed upon the RSL Retirement list. Why would that be? Having viewed a number of service records I cannot recall having seen that notation before. A later notation mentions his being added to an 'x' list, that list is all about ex-service members being added to a category of reservists. So, why the RSL and why a particular category of reserves? 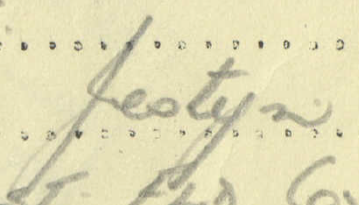 By the way, this handwriting in the example above is believed to be Major Moulds, it seems to match other examples in his record and maybe even another document? On that issue, the letter 'R' in 'Retirement' looks vaguely familiar. as does the missing crossbar from the 't' also in 'Retirement'. Any Takers? Well just in case, the handwriting in this example above can be seen as closely matching the handwriting in Verse 70. You might also consider the way the letter 'W' has been written. There will be a follow up post on this specific topic. 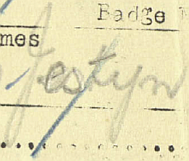 The RSL in its prime years had a large membership, 337,000 in 1946 for example. Its ranks were made up of ex NCOs, other ranks and junior officers with others, mostly, but not exclusively, of the rank of colonel and above, being recruited into the upper echelon of The Association. The Association used to boast about having between 100,000 and 130,000 members some of whom were armed with rifles and machine guns were available to them according to their own accounts. The RSL had what might best be called 'satellite' organisations, these were charged with dissemination of printed materials and the propaganda offensive as well as counterintelligence work against the rise of communism in Australia. One splinter group undertook some more extreme tasks. Some time ago I requested and purchased a copy of the official file from NAA of Major Moulds. Above is his file image, you can see that he wasn't a particularly tall man, his file also tells us that apart from a short illness, he was very fit. He served at El Alamein and Tobruk as well as in PNG. It was at the latter part of his service that he was awarded the MBE for outstanding bravery and extraordinary devotion to duty. The citation will be published here in the next post. What we can say is that we have more examples of his writing and that confirmed for me that this is the man who signed the Verse 70 in the copy of the Rubaiyat purportedly given to Alf Boxall By Jess. The discovery of Major Moulds and his signature now not only calls into question but throws into grave doubt the statements of Alf and Jess. We have also found details of a number of 'Special' courses attended by the Major and have noted that there is a specific mention of him in relation to an RSL involvement at the latter end of the war. There is a mention of what appears to be an attachment to 8th Water Transport but the page is a little unclear. All in all, a most interesting document that was worth the wait. those with search skills will be able to access the full file at NAA. BUT! What about that capital 'E'? Next Post by the weekend.